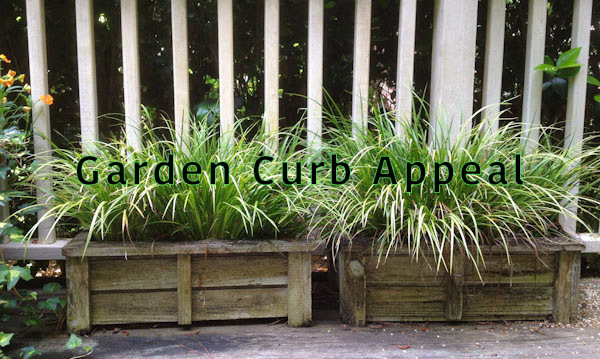 Whether you are staging your house for the real estate market or you want to give your neighbors something nice to look at, there are a number of simple gardening methods you can use to boost your home’s curb appeal. Everyone is taught “Don’t Judge A Book By Its Cover” but we all know we took one look at The Great Gatsby and said, “A giant ghost lady bearing down on an unsuspecting New York City? This is for me.” First impressions count, especially in real estate. And when possible homebuyers look at your house from the street or sidewalk, what they see on the outside is just as important as what they’ll see inside, if not more. A good way to improve the exterior of a house is proper garden and lawn care. First and foremost, it needs to look like someone has been happily living here. If the lawn is tall and unkept, shrubs are overgrown and ivy is clinging to the walls, it looks bad. Take out your tools and clear away any plant debris that may be blocking windows or paths or otherwise making the house look derelict. As you start putting in new plants to spruce up your home and yard, pay attention to upkeep. A beautiful flowerbed with weeds is not beautiful and a vibrant patch of trees with brown branches is not vibrant. Put in the effort to mulch, water, weed and trim your yard and garden. Just like a talk show host, it takes effort to make a home look good. The best way to add life to a home’s exterior is to add some color. The garden is a great way to accomplish this. Before you start picking out flowers for your home garden, you need to think about your home’s character. Is its architecture old or new? Is it masculine, feminine, both or neither? Is it reserved or energetic? These kinds of choices should guide what kind of a garden it has. A large, bright patch of flowers in front of a simple ranch house will look out of place but a more focused group of lighter colors would do the trick. If you are going to start adding flowers to your garden or yard, remember not to make it feel too intentional. Symmetry in a home garden looks forced when it should be a reflection of personal aesthetics. Get flowers and plants that feel right and put them where you like. And if you want to use window baskets or containers from a hardware store or gardening supply store, that is fine. Hopefully, these tips put you on the right path toward using gardening to boost your home’s curb appeal and stand out in your neighborhood. And don’t stop there: make sure you take other efforts, such as cleaning gutters and roofs and painting faded or peeling spots.